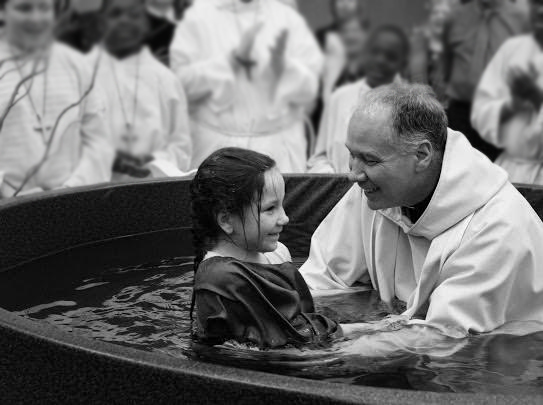 Candidates for this program are children between the ages of seven and eighteen that have not been baptized. The process of initiation of children into the Catholic Church has been adapted from the Adult Rite of Initiation (RCIA). The focus is on formation of the whole family growing in relationship with Christ. The development of faith in our children is unique, therefore the instruction and influence of parents is crucial. As part of this process, we depend on the parents’ commitment to bring their child to church and the various celebrated Rites. At the Easter Vigil Mass the children/youth receive the three initiation sacraments: Baptism, Confirmation and Eucharist. of the age of reason, which by Cannon Law is suggested to be about the age of seven. seeking Christian initiation on their own with parental permission or under the direction of their parents or guardian.